Sample frames of all scenes from the YUPENN Dynamic Scenes data set. 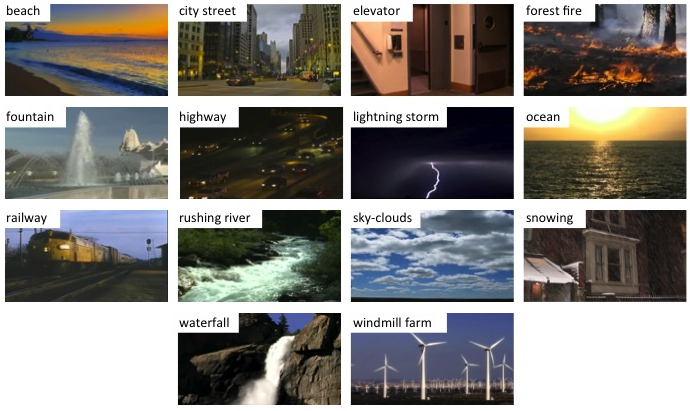 In addition, a new data set (YUPENN Dynamic Scenes) is introduced that contains 420 image sequences spanning fourteen scene categories, with temporal scene information due to objects and surfaces decoupled from camera-induced ones. This data set is used to evaluate classification performance of the various orientation-related representations, as well as state-of-the-art alternatives. Approach overview. The input image sequence is spatially subdivided. Outer scale is determined by the spatiotemporal support of the individual subdivided regions. Relative position of subdivided regions captures scene layout. Next, a distributed feature set is extracted within each subdivision and concatenated to form the global feature descriptor, e.g., distribution of spacetime orientation measurements indicating the relative presence of the chosen orientation set. Finally, the feature descriptor is classified using a nearest neighbor classifier (NN). Evaluation was conducted on two data sets: (i) Maryland "In-the-Wild and (ii) the new YUPENN Dynamic Scenes. Since the Maryland data set contains large camera motions and scene cuts, it is difficult to understand whether classification performance of approaches depends on their success in capturing underlying scene structure vs. characteristics induced by the camera. To shed light on this question, the YUPENN dataset is introduced which contains a wide variety of dynamic scenes captured from stationary cameras. It is found that spacetime oriented energies designed to capture both spatial appearance and temporal dynamics are the best performer on the stabilized data set. Overall, the spacetime oriented energy feature consistently characterizes dynamic scenes whether operating in the presence of strictly scene dynamics (stabilized case) or when confronted with overlaid, non-trivial camera motions (in-the-wild case). The alternative approaches considered are less capable of such wide ranging performance. YUPENN Dynamic Scenes data set is available at our dataset page. K.G. Derpanis, M. Lecce, K. Daniildis and R.P. Wildes, Dynamic Scene Understanding: The Role of Orientation Features in Space and Time in Scene Classification, IEEE Conference Computer Vision and Pattern Recognition (CVPR), 2012. C. Feichtenhofer, A. Pinz and R.P. Wildes, Bags of spacetime energies for dynamic scene recognition , IEEE International Conference on Computer Vision and Pattern Recognition (CVPR, 2014. C. Feichtenhofer, A. Pinz and R.P. Wildes, Spacetime forests with complementary features for dynamic scene recognition, British Machine Vision COnference (BMVC), 2013.